Welcome to Monday! I'm exhausted. It was a very hectic weekend with non-stop activities from soccer games (little Miss A. scored her second goal of the season! to seeing Damien Hirst's St. Sebastian. Wao was this piece powerful. This is the St. Sebastian I am used to seeing) So you can see my weekend was very varied. So for this Monday morning I just offer you some images that have been inspiring me lately. First off, loving the effect of several small tables to replace the singular coffee table. Also the large pedestals flanking the sofa are fabulous. This is an easy way to add drama, fill a space, and add height to a room. 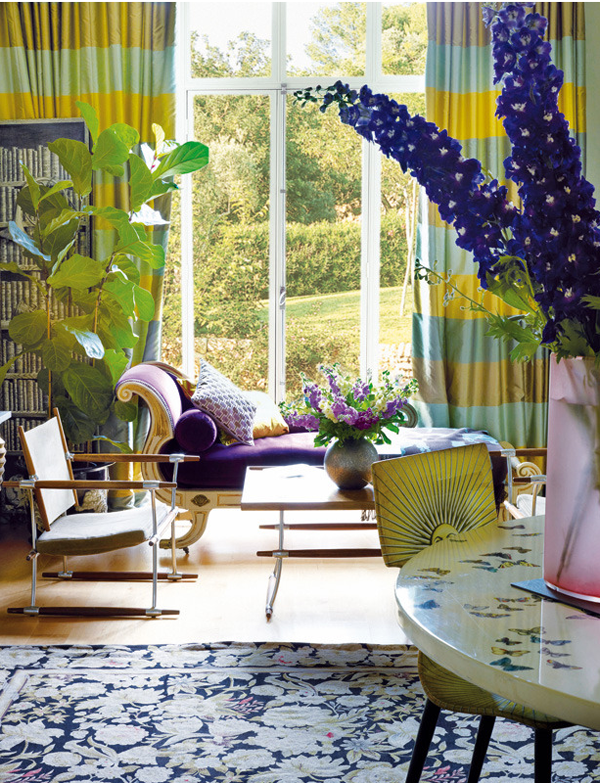 Loving this curvy purple chaise next to the multicolored striped curtains. I love the concrete walls and ceiling of this apartment in Berlin and the huge 'L' shaped sofa. It used to be a real bunker. Ok, now get back to work and start the week off right. I needed this inspiration today. Total lame brain over here! That room is heaven! Love the black chandlier with the light pink walls - such an unexpected contrast! 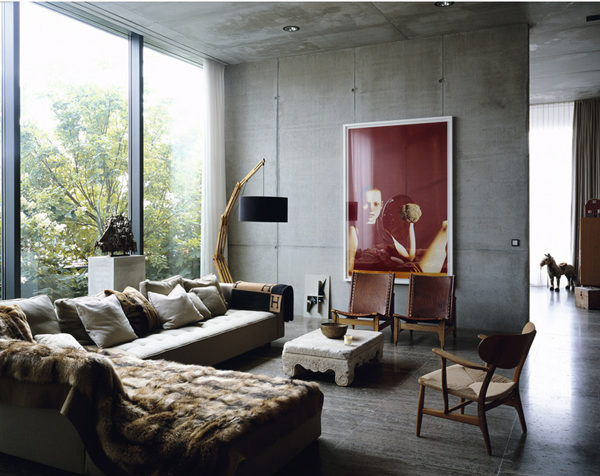 I love how they layered some fur throws to bring in some warmth into that room with concrete walls, gorgeous space. Aww, the bold colors in the first two photos was just what I needed today - my lil one started daycare so ya know it's been a rough morning. I'll take a serving of everything in the first and the chaise and the curtains in the second. Fab, fab, fab! Happy Monday lady. Love the first room and those mid century looking purple chairs! I'm trying to wiggle my nose like Samantha on Bewitched to see if I can launch myself into the first room...Love it. Wow, first room is so dramatic. Love the art and black chandelier! Happy Monday! I'm crazy about the bold, large scale art in the first photo. Get some rest today! I helped take 200 high schoolers to War Horse yesterday among other child centered activities this weekend. I know how you feel! I'm kinda in love with that rug in the first picture and those velvet chairs are so rich! I think I need a little purple velvet in my life too. I want that chair. So cute! I love anything British - I am heading to London in two weeks and couldn't be more excited! The bunker is fab! I like that first pic a lot!!! 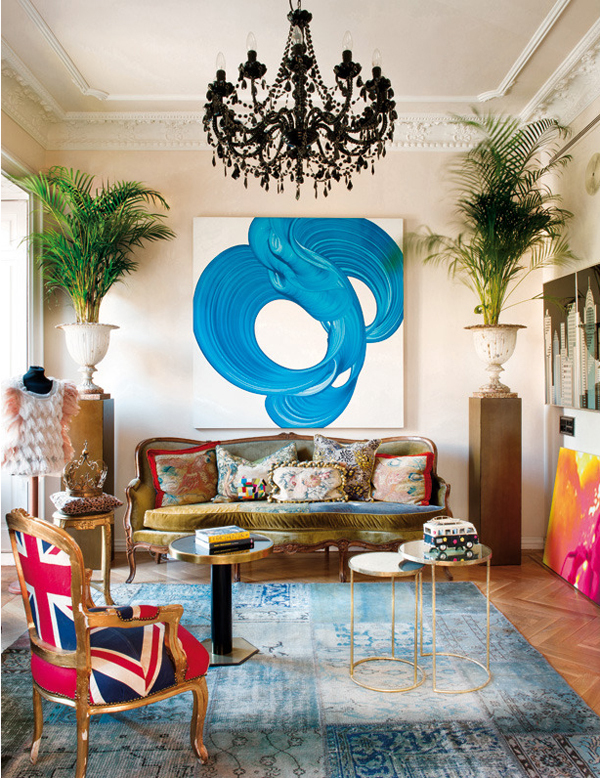 These are such fabulous rooms! I love the first room with those gorgeous nesting tables! First of all, that Damien Hirst St Sebastian---leaves me speechless! 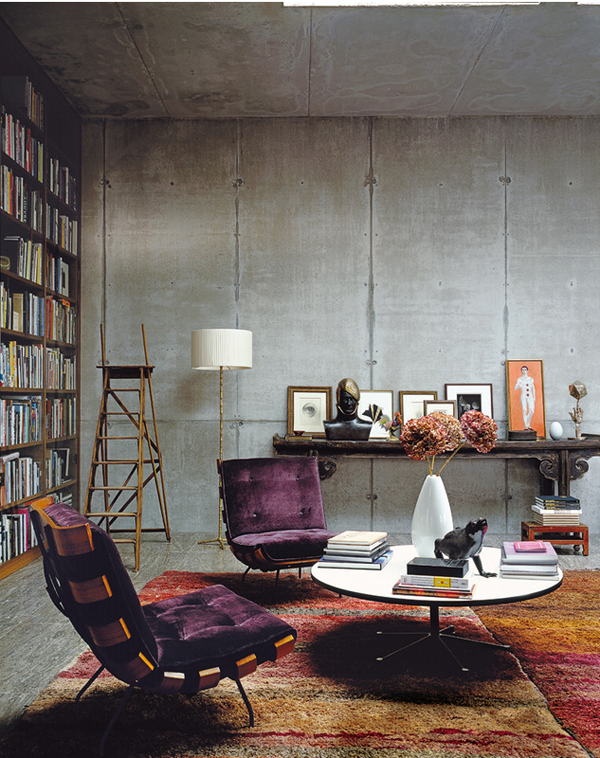 Then, the Berlin place- who would think that with all that concrete a place could be so cozy and elegant- thanks for finding such good inspiration to start the week with! I couldn't agree more! It's just lovely...I would love that Chady to the moon! I am loving that Union Jack chair in the first picture!